Our SeaLab Program give you the flexibility to customize your field trip. Whether you are interested in a multi-day program or just a single activity, SEACAMP San Diego can provide your school or group with an unforgettable field trip experience. Our comprehensive marine science activities provide exciting, innovative, and interactive marine education opportunities for students or all ages. We offer unique hands-on experiences that allow students to directly interact with their local marine environments. All labs and field activities can be conducted individually or together and can be customized. All prices include instruction, supervision and necessary gear. All field activities are subject to weather and water conditions. Looking for us to come to you? Check out our Outreach Program! SeaLab Programs a mostly offered during the fall and spring semesters. Program dates are first come, first served and availability is contingent upon SEACAMP San Diego resources. If you would like more information or would like to schedule a program, please give us a call at (800) SEACAMP or complete and return the SeaLab Request Form. Once we have an idea of group size and desired activities and time frames, we can customize a program for you. SEACAMP San Diego can customize any day camp schedule you would like incorporating labs and field activities. We are able accommodate a multiple day program, a single day program, a half-day program or just one activity. 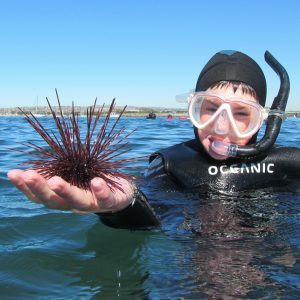 The flexibility and variety our SeaLab Program offers schools and students a unique opportunity to provide students with an unforgettable field trip. See our list of Field Activities and Labs for descriptions and tuition costs. Tuition does not include transportation to and from SEACAMP San Diego or transportation between activities, if required. If you are interested in scheduling a program with us, please give us a call at (800) SEACAMP or complete and return this form. Once we have an idea of group size and desired activities and time frames, we can customize a program for you. Add a Lab to any Field Activity for just $5.00 more per participant. $1000 for up to 20 participants or $50 per participant for 21 – 55 participants. Add a Lab to field activity for an additional $100 for up to 20 participants or $5 per participant. Students meet the SEACAMP San Diego staff at the public park at Mission Point. Here, students are taught the basics of snorkeling, fitted for gear and then taught to snorkel in the shallow water near the protected beach. Once students are comfortable, they snorkel a short distance across the cove to a rocky reef area where they can observe fish, invertebrates and algae. On the beach, students are taught to work a long collecting net called a seine and attempt to catch some local, inshore marine life. Once caught, specimens are placed in buckets and instructors teach about them and their habitat. All animals are returned at the end of the session. Students meet the SEACAMP San Diego staff at Kellogg Park at La Jolla Shores. Here they are taught the basics of Boogie Boarding and the science of tides, waves and currents. After students suit up in the provided wetsuits, they get in the water to do activities that help demonstrate these oceanographic processes. Afterwards, students are allowed to experience the waves of La Jolla while boogie boarding under the supervision of the SEACAMP San Diego staff. For larger groups, those that are not boogie boarding are taken on a beach walk along the shore and examine a variety of plants and animals, and led in instructive games. Students meet the SEACAMP San Diego staff at Kellogg Park at La Jolla Shores. Here they are taught the basics of snorkeling, fitted for gear and then they are off to a site for a snorkel. While snorkeling, staff provides instruction in and identification of local marine life, including marine mammals, fish, sharks and kelp. $400 for up to 20 participants or $20 per participant for 21 – 60 participants. Students join the SEACAMP San Diego staff at the Tidepools at Sea Ridge Drive in the Bird Rock area. Here the students learn the basics of tides and the stresses of intertidal life. Students are then allowed to explore the intertidal zone and collect specimens in buckets. At the end of their exploration students are brought together to identify and discuss the specimens collected. An emphasis is placed on adaptations for intertidal living and conservation. All animals are returned at the end of the session. $600 for up to 20 participants or $30 per participant for 21 – 35 participants. Add a Lab to this field activity for an additional $100 for up to 20 participants or $5 per participant. This activity takes place at SEACAMP San Diego facility. Students are instructed on the fundamentals of kayaking, and then embark on a kayak excursion on SEACAMP’s tandem, sit-on-top kayaks. From the kayaks, students can observe a wide variety of bay animals. Additionally, students are taught to work a long collecting net called a seine, and from the beach, attempt to catch some local, inshore marine life. Once caught, specimens are placed in buckets and instructors teach about them and their habitat. All animals are returned at the end of the session. $1200* for up to 20 participants or $60* per participant for 21 – 35 participants for a three hour boat trip. Students board a charter research boat for a cruise in San Diego’s Mission Bay. After an orientation the vessel heads out of the bay into the Pacific Ocean for a feel of the ocean waves, a sampling of some Giant Kelp and possibly a sighting of dolphins and sea lions. Seasonally we may also cruise around in search of California Gray Whales. On the way back into the bay, staff discusses the Giant Kelp and the ecology of the kelp forest. Once back in the bay, the trawl net is deployed and retrieved with the help of the students. Each species of animals collected are displayed and discussed by the SEACAMP San Diego staff. Next, the students are broken up into smaller groups and rotate around the boat to several stations that include plankton collection, plankton evaluation, and examination of trawl animals. On the way back to the dock, the trawl animals are released and birds and marine mammals of the bay may be observed. Students have the opportunity to rotate through several hands-on stations that will encompass fish adaptations, invertebrates and sharks. Students have the opportunity to rotate through several hands-on stations that will encompass fish adaptations, invertebrates, sharks and seining. In this lab students will be introduced to the major phyla of local marine invertebrates. Students will explore these animals’ characteristics and adaptations through the use of a variety of live and preserved specimens. The lab will conclude with an in-depth study of the external and internal anatomy of a squid, through dissection. Particular emphasis can be placed on invertebrates likely to be seen during SEACAMP field activity. In this hands-on lab, students will study fish, including sharks, skates and rays, anatomy and behavior. Observations and discussion will occur regarding adaptations that allow fish to flourish in specific environments. Students will explore the differences between the three different classes of fish: Agnatha, Chondrichthyes and Osteichthyes. In the second half of the lab, students examine preserved specimens and may participate in a fish dissection. Particular emphasis can be placed on fish likely to be seen during SEACAMP field activity. This lab is designed to give students a wide overview of all of the types of life in the ocean. Topics that may be covered include Plankton, Algae, Invertebrates, Fish and Marine Birds, Reptiles and Mammals. Live specimens, artifacts and photographs will be used as teaching tools. A major goal of the lab is to stress the diversity of life in the ocean. Particular emphasis can be placed on organisms likely to be seen during SEACAMP field activity. Join us as we dispel the myths about sharks. Using live and preserved specimens, our staff share interesting facts about sharks and their life cycle. We discuss seven shark senses as students observe and touch sharks’ preserved skin, fins, and teeth. We may employ live specimens from the on-site shark tank for observations and preserved specimens to explain shark anatomy. We will conclude the lab with information on shark conservation and research. We close this lab with a discussion of what we can do to help protect sharks from extinction. Plankton lab has students discover the importance of plankton in aquatic ecosystems. Students learn the two types of plankton, phytoplankton and zooplankton, and how they remain unique in the food web. This lab generally concludes with a comprehensive hands-on activity, allowing students to showcase their knowledge of plankton. Particular emphasis can be placed on plankton likely to be seen during the SEACAMP visit. This workshop contains a broad overview of deep-sea organisms, bioluminescence, and nighttime migration. Students learn of the challenges of living in the dark and how animals use senses other than sight to survive. Students participate in a specially-developed activity showcasing the challenges of living in the dark. This workshop covers the taxonomy, physiology, and behavior of marine mammals. With an emphasis on the diversity of marine mammals, students also discover these animals’ relationships to habitats and interactions with humans. This workshop may include a discussion regarding marine mammal training and captivity. 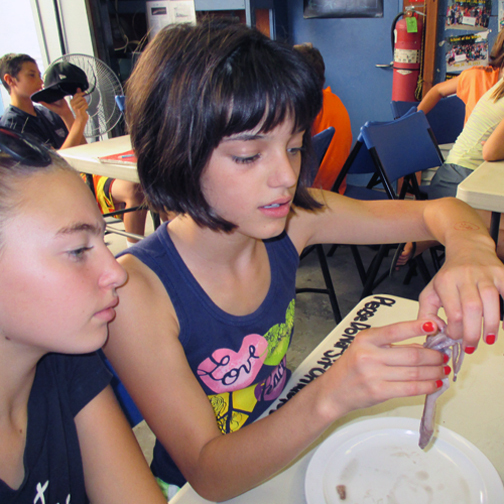 This is the only lab at SEACAMP San Diego that explores marine reptiles. Students learn the major characteristics of sea turtles with hands-on activities. Other topics in the lab include turtle reproduction, stresses of sea turtle hatchlings, species identification, and ocean conservation. All SEACAMP San Diego’s programs are centrally located in the community within easy reach of full medical facilities, including emergency care. All facilities are easily accessible by car and ambulance in case of emergency and professional medical care is on call 24 hours a day. Additionally, SEACAMP San Diego Instructors possess at least a college degree and are certified Red Cross Lifeguards with First Aid, CPR for the Professional Rescuer and Oxygen Administration training. SEACAMP San Diego does not retain a nurse on staff, although we do have a paramedic consultant on call. Camp location is on Mission Bay, approximately 10 miles north of downtown San Diego. This location has our dorms, restrooms, classrooms, aquariums and access to a private beach. All of our lab & workshop facilities are tailored for the specific needs of our program and include a classroom with a running seawater system, a full aquarium room with touch tanks, a shark tank with live specimens, microscopes, and the added security of private beaches.